No undergraduates enrolled in a university in Nam Định Province in the 2017 admission season, the same as last year, but the school is still operating thanks to its postgraduate programme. The reason for this situation was because the quality of undergraduate education in private schools is no match for public schools like the Hà Nội University of Science and Technology, claimed its rector. Though it only has one masters programme in business administration, the school offers six courses to about 200 students per year, who "single-handedly" keep it afloat. In a recent meeting with the Committee of Culture, Education, Youth and Children under the National Assembly, the school proposed a plan to expand its masters programme to different majors. “It could be said graduate school has developed LTVU. At present, we offer only one major in business administration with a quota of 250 students a year as allowed by the Ministry of Education and Training. Student recruitment has been successful. In some years, we even recruited more than this quota. This reflects the trust the public has in us and is the results of our efforts. In the past six years, we have never received less than 200 students annually,” the rector told Tiền Phong (Vanguard) newspaper. The university is not a single case. In 2017, the Graduate Academy of Social Sciences (GASS) aimed to recruit 1,600 graduate students while the number approved by Ministry of Education and Training (MoET) was only 86. Not only student recruitment, the training system used by GASS is another controversial issue. According to a MOET report, in the majors of law and public policy in 2015 and community service in 2014, several professors advised more postgraduate students at one time than regulations permit. Specifically, Professor Võ Khánh Vinh instructed 29, 10 and five students in law, public policy and community services respectively, while Professor Hồ Sỹ Sơn guided 18 students while Professor Hồ Ngọc Hiên advised six. MoET regulations dictate that one professor can instruct up to seven students, an associate professor or DSc can teach five, while PhD candidates with at least one year of teaching experiences can teach three. The MoET report also shows that 1,114 and 1,697 GASS students successfully defended their master theses in 2015 and 2016 respectively. Additionally, MoET detected several signs of erasing and fixing data in degree issuance by GASS. To tackle fraud among postgraduate departments, MoET’s inspection department recommended strengthening the management of training and degree issuing processes. The quality of the theses published by master’s students is another issue. PHT, a teacher of a high school in Hà Nội, recently successfully defended a master’s thesis at the Institute of Literature under GASS on an author’s art of writing short stories, an unoriginal topic in Vietnamese academia. The instructor told T that the thesis topic should be original but he approved the topic anyway. “The review board just asked me to change a few points. Presenting the thesis, I focused only on my reasons for choosing the topic. When I said that it was for my future teaching career, they accepted it,” said T.
This is not a singular case at GASS. Professor Ngô Huy Cương from Department of Law, Việt Nam National University (VNU) in Hà Nội said that current master theses reflected the “irresponsibility” of students. “Topics must not be duplicated since they will contribute nothing to science. However, many students imitate the model of existing theses in writing a new one,” he said. Cương told Thanh Niên (Young People) newspaper he had seen two different theses with the topics of “Marriage institution in the law of marriage and family in 2000” and “Marriage institution in the law of marriage and family in 2014” despite the small differences between the two documents. According to some experts, the ease of getting a topic approved is used by universities to attract master’s candidates. Several reasons have been given for this phenomenon. 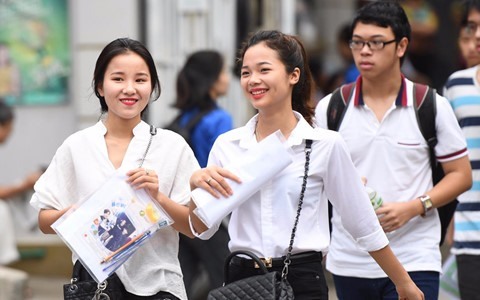 According to Professor Trần Ngọc Vương of Ha Noi University of Social Sciences and Humanities (USSH), many unemployed graduates enroll in postgraduate studies as they cannot find work. Others take postgraduate programmes to get the degrees necessary for their careers. Therefore, the quality of postgraduates cannot be guaranteed. “I think that it is bad when a teacher instructs for money and when a student takes a master’s course for something other than science,” said Vương. Professor Trịnh Ngọc Thạch of USSH considered the failure of postgraduate programmes as “a systematic error”. According to him, a university cannot survive with just a few students. Therefore, it has to be able to attract more candidates, creating a vicious cycle which decreases educational quality.